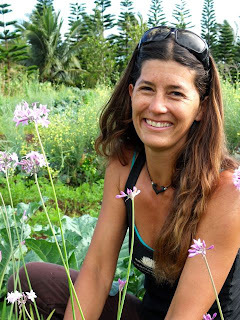 Follow My Dream: What is a CSA? I knew Stew, our farm intern and my fellow classmate, would get your attention!! Lucy is doing much better, thank you all for your comments! $120.00 later, we learned she had some kind of bacterial infection. She has 3 prescriptions and a check up on Saturday. My first week of employment since we have been on the island has been excellent! Jillian hired me on as the CSA Manager for the farm. 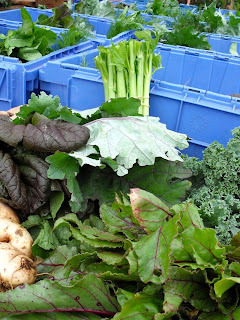 CSA is an acronym for Community Supported Agriculture and before I write anything else I'd like to share what a CSA is. Below is an excerpt from Grant Family Farms, the CSA we were members of in Colorado, detailing the business structure. 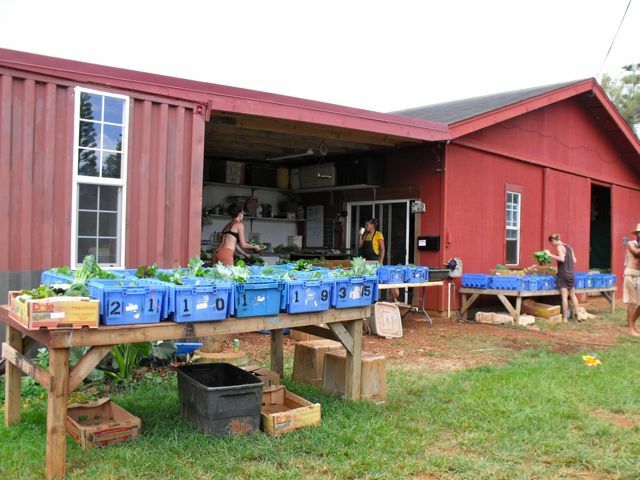 Recently I learned that Grant Family Farms is the largest CSA in the country with 3000 members in 2009! 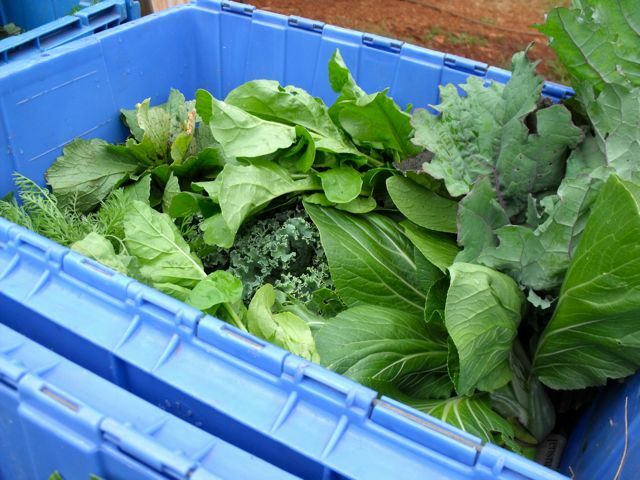 Currently, we provide for 37 members and Papayas (which equals 6 boxes) every week. To find a CSA in your area click here. 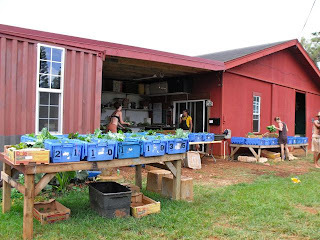 CSA is a partnership of mutual commitment between a farm and a community of supporters that provides a direct link between the production and consumption of food. Supporters cover a farm's yearly operating budget by purchasing a share of the season's harvest. CSA members make a commitment to support the farm throughout the season, and assume the costs, risks and bounty of growing food along with the farmer or grower. Members help pay for seeds, fertilizer, water, equipment maintenance, labor, etc. 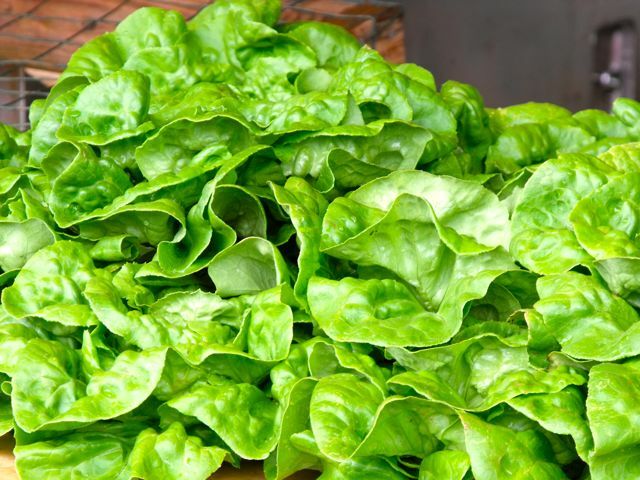 In return, the farm provides, to the best of its ability, a healthy supply of seasonal fresh produce throughout the growing season. Becoming a member creates a responsible relationship between people and the food they eat, the land on which it is grown and those who grow it. 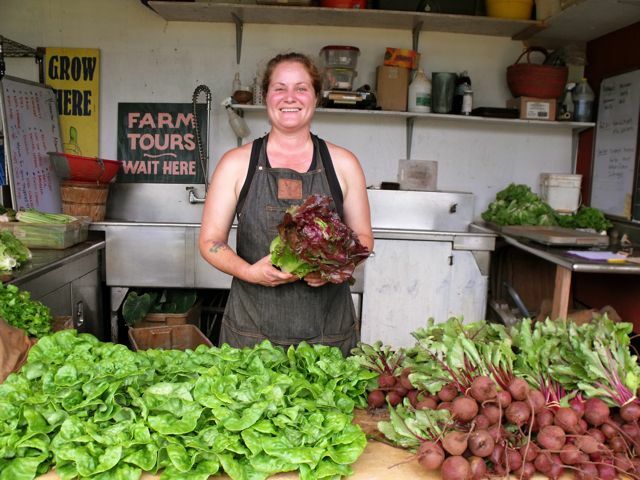 This mutually supportive relationship between local farmers, growers and community members helps create an economically stable farm operation in which members are assured the highest quality produce at a fair price. 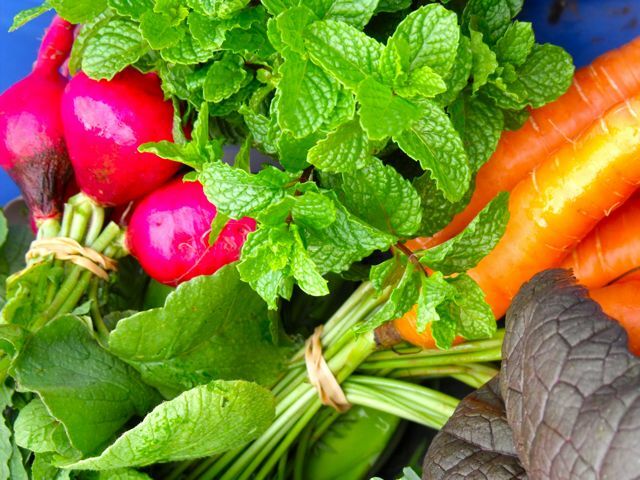 In return, farmers and growers are guaranteed a reliable market for a diverse selection of crops. CSA reflects an innovative and resourceful strategy to connect local farmers with local consumers; develop a regional food supply and strong local economy; maintain a sense of community; encourage land stewardship; and honor the knowledge and experience of growers and producers working with small to medium farms. Plus, by dealing with local farmers you are reducing your carbon footprint and supporting local business. This, for me, is work that matters. For those of you who know me well, this is my passion. Being in the right place at the right time created this opportunity. 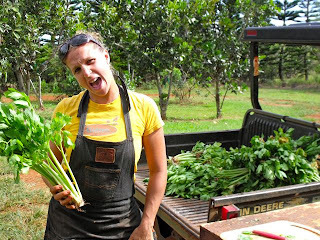 Jillian and her husband are creative visionaries building an empire on the north shore. Their farm is infused with passion, creativity, joy, camaraderie, education, love, goodwill and acceptance. I am thrilled to be working with them and in effect included in their family. My intention is to let everyone know what great services these folks have to offer. My job as the CSA Manager is to insure current members receive timely communications in regard to their questions or concerns, be the harvest leader on harvest days and generate new members. 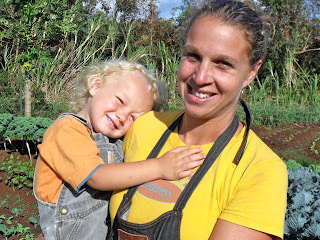 I spent this week learning how Jillian runs this tight operation, answering member emails, working with Dan and Papayas, connecting with Pure Kauai to establish a business relationship providing our produce in vacation homes, and creating a newsletter. I have a lot to learn and a lot to do and I am revitalized. I love working from home or going to the farm; no time clock to punch, working with the kind folks of this beautiful island and growing a business. This week I am going to create a facebook page and I hope you'll like it. One of the intentions is to provide produce to folks who rent a condo or have a time share for a week or two and would like some fresh, organic, local produce to eat while they are here and save a lot of money in the process! Jillian was totally stoked on the celery, a long term crop that had finally been harvested. A close up look inside one of the boxes. 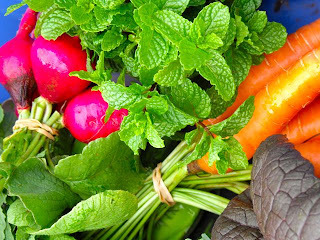 Mint, radish, carrots. Hawaiian purple sweet potatoes, osaka (from the mustard family), beets and celery. The beets are in the front, the leaves with red veins. 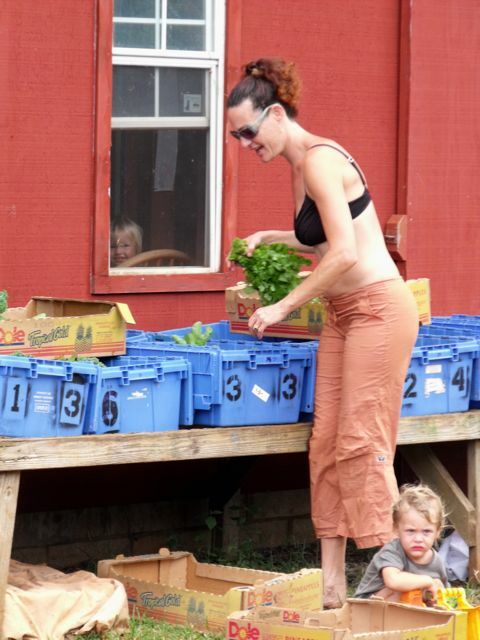 Tara fills the boxes (owner of Kauai Fungi) while Emma's kids "help". 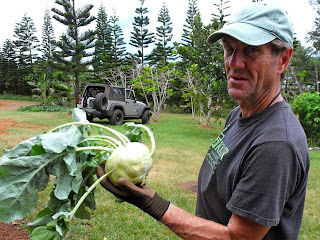 Fellow classmate and massage therapist, Casey Holt found a huge kohlrabi. At home I unpacked this weeks box of produce. One of the reasons I love being in a CSA is that I get to try all kinds of new things and receive an abundance of favorites. I got mild green peppers, carrots, bananas, papaya, celery, book choy, basil, butter lettuce, cilantro, curly kale, red russian kale, osaka and arugula. All organic and all for $28.00! In other news, Dan is getting the swing of the produce thang, looking for more local farmers and learning a lot about supply and demand. He says "it's all goin well man!" My meditation teacher asked me to edit some videos! 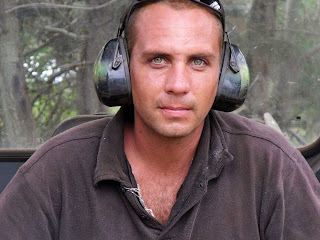 Monday Dan and I are going to meet with him. We need to get his video into my computer. George Clooney's movie The Descendants has been wreaking havoc in Hanalei with the locals and will wrap up filming in a couple of weeks. The fourth Pirates of the Caribbean will start shooting soon. Our friend Dan from Da Kine Wine is providing wine and spirits for the cast and crew while they are here. We have thought about submitting our resumes to the Kauai Film Commission thinking we might get some work editing dailies. If we did it would be excellent money but kill everything we've got going on! book choy is supposed to be bok choy! LOL! Aloha Marta. 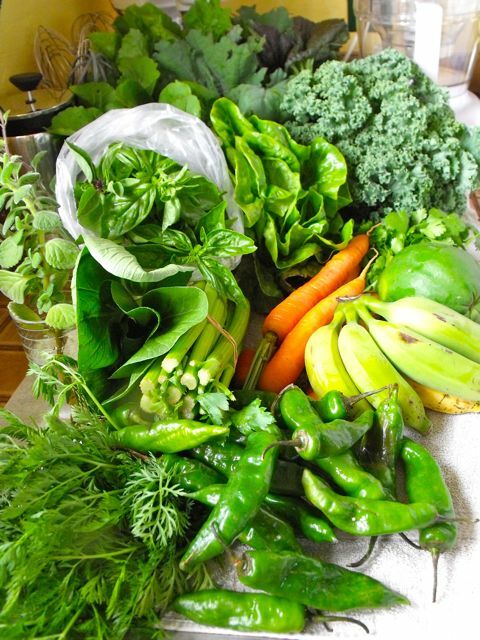 We look forward to joining your CSA. Photos look great!! See you in a month. Tom and Christena.